°“Full Factorial Design Applied to the Synthesis of PdAg Nanobars by the Polyol Method and the Perspective for Ethanol Oxidation” R. Carrera-Cerritos, C. Ponce de León, J. Ledesma-García, R. Fuentes-Ramírez and L. G. Arriaga. RSC Advances. (2014), 4, 16632–16640. °“Staircase and pulse potential electrochemical techniques for the facile and rapid synthesis of Pt and PtAg materials”, N. Arjona, M. Guerra-Balcázar, G. Trejo, L. Álvarez-Contreras, J. Ledesma-García, L.G. Arriaga, , Electrochim. Acta 115 (2014) 46–55. °“Improved Pd electro-catalysis for oxygen reduction reaction in Direct Methanol Fuel Cell by reduced graphene oxide”, R. Carrera-Cerritos, V. Baglio, A. S. Aricò, J. Ledesma-García, M. F. Sgroi, D. Pullini, A. J. Pruna, D. Busquets Mataix, R. Fuentes-Ramírez, L. G. Arriaga, , Appl. Catalysis B. (2014) 144, 554– 560. °“Electrocatalytic Activity of Well-Defined and Homogeneous Cubic-Shaped Pd Nanoparticles”, N. Arjona, L. Ortiz-Frade, G. Osorio-Monreal, L. Álvarez-Contreras, M. Guerra-Balcazar, J. Ledesma-García, L. G. Arriaga, , J. Mater. Chem. A (2013) 1, 15524-15529. °Micro fuel cell microfluidic without membrane and method of manufacture it,in process. °Support large electrochemical surface based in dioxide antimony doped tin and method of manufacture. °Alejandra Álvarez López (Doctorado en Electroquímica-CIDETEQ).”Development of proton exchange membranes from organic-inorganic composites”. Ended January 27, 2012. Co-direction. °Francisco Mherande Cuevas Muñiz (Doctorado en Ingeniería-FI-UAQ).”Synthesis and characterization of electrocatalytic materials supported on carbon nanotubes and their application in fuel microcells.” Completed June 7, 2013.”. °Noah Walter Velazquez Arjona (Doctorate in Electrochemistry-CIDETEQ “Determination of electrokinetic phenomena in micro and nanofluidic channels in type and using formic acid and glucose as species analysis.” Processing. Co-direction. °Dector Andres Espinoza (PhD in Electrochemistry-CIDETEQ). “Micro-fabrication and electrochemical microcell evaluation integrated fuel as an energy source for electronic systems”. Processing. Co-direction. °Euth Ortega Ortiz (UAQ Doctorate in Engineering). “Development of a microfluidic fuel cell air-breathing type using selective catalysts for the conversion of electrical energy”. ° Andres DectorEspinoza (Master of Electrochemistry-CIDETEQ). “Development of electrocatalytic nanomaterials for application in fuel microcells LMMFC type”. Completed. Co-direction. °Ricardo Antonio Escalona Villalpando (Masters in Environmental Science and Technology-FQ-UAQ).”Development Bioánodos from glucose oxidase (GOx) and dehydrogenase (GDH) for application biomicroceldas using glucose as fuel.” Processing. 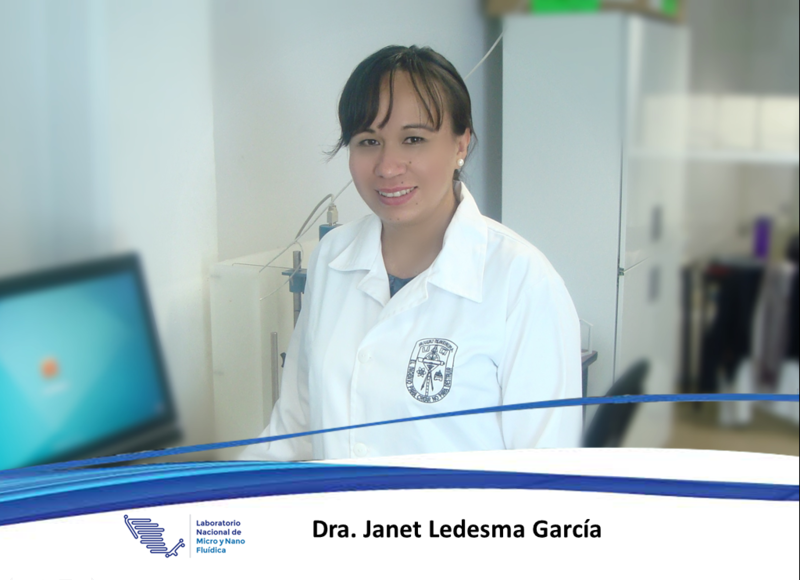 °Berenice Lopez Gonzalez (Masters in Environmental Science and Technology-FQ-UAQ).”Developing a biocátodo based on laccase application microcells with fuel.” Processing. °Astiazarán Jorge Azcarraga (Chemical in Food-FQ-UAQ). “Preparation of proton exchange membranes based on Nafion-modified mesoporous silica and G4 PAMAM dendrimer.” Completed: May 11, 2012. °Angel Frías Hernández (Civil Engineering-FI-UAQ).”Preparation of a guide for the teacher of the subject of Engineering Materials.” Completed: November 29, 2013. °Paulina Rodríguez García (Chemistry Engineering Division of Natural Sciences and Exact-UG).”Hydrogen storage Through a polymer matrix modified polyether ketone with manganese oxide.” Completed: May 28, 2013. °Head of Academic Group “Nanotechnology” Consolidated Grade UAQ-CA-111. From November 15, 2012. Ministry of Education, Faculty Improvement Program. °Appraiser Member of Accredited Assessors Register CONACYT (QSAR)-QSAR-07-20043-2010. National Council for Science and Technology.